Mousse-Filled Plums for sale. Buy online at Zingerman's Mail Order. Gourmet Gifts. Food Gifts. Velvety dried plums from France's plum capital. Those are three words that don’t sound like they belong together, but the town of Agen in southwestern France is out to convince us otherwise. They grow plums that are particularly sweet and juicy and then dry them to produce a moist, rich, caramelly prune. For Christmas they de-pit the prunes and fill ‘em with a velvety mousse made of their own fruit pureed with a smidge of sugar, lemon, and vanilla. Nestled in a cobalt blue tin, they make a sumptuous gift for anyone who loves fruits or sweets. They’re especially excellent paired with a glass of good brandy or a mug of tea. "I always try to talk people who come to Paris into trying Pruneaux d’Agen fourrés, which are prunes stuffed with prunes. In spite of their reputation, prunes are a great delicacy in France and rightfully so; one taste of even just a regular pruneau d’Agen, and you’ll plotz the first time after your first bite... 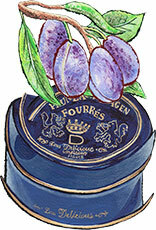 If you’re ever invited to a French person’s home, a tin of Pruneaux d’Agen fourrés is a gift par excellence."